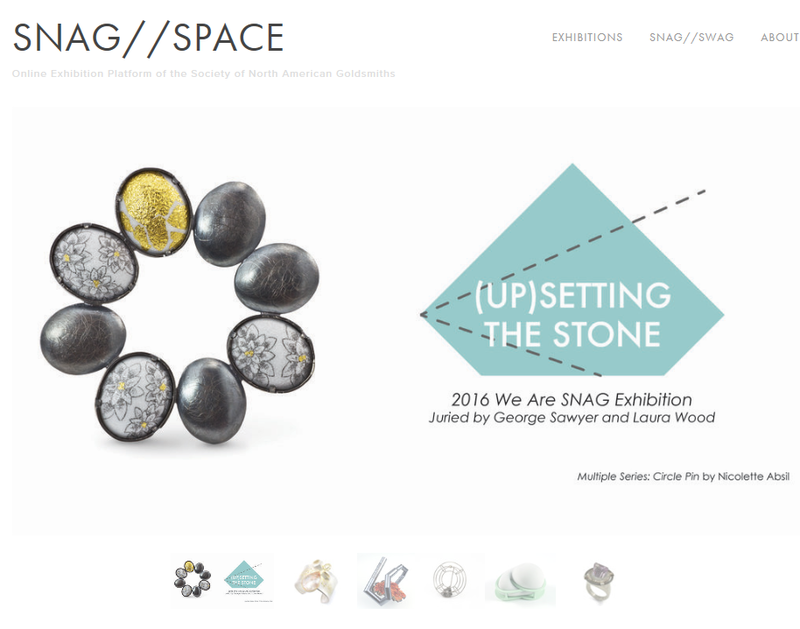 As the third juried member exhibition in the We Are SNAG series, (Up)Setting the Stone is an online exhibition focused on the setting. Stone setting has been utilized in some of the earliest known jewelry. There are thousands of variations based on a few different techniques. Juried by George Sawyer and Laura Wood, this collection of work expands to jewelry, objects, vessels, and sculpture. Laura Wood is a full time jewelry artist living in Asheville, North Carolina. Her newly relocated studio is in the Renery Creator Space in the downtown South Slope District. Her work has been selected for many exhibitions throughout the United States, including The Contemporary Jewelry Show at the Penland Gallery (NC), Shift: Makers that Dene, Expand, and Contradict the Field of Art Jewelry at the Grunwald Gallery (IN), and the Lydon Emerging Artist Exhibition (LEAP) at the Society for Contemporary Craft (PA) and most recently as a 2015 SNAG Emerging Jewelry Artist at the annual Sculpture, Objects, Functional Art and Design Expo (SOFA) in Chicago, Illinois. Her work can be found in select galleries in the United States and in the permanent collections of the Gregg Museum of Art at North Carolina State University and The Racine Art Museum in Racine, Wisconsin. Publications include, 500 Paper Objects (Lark Crafts, 2013), Behind the Brooch (Shier Publishing, 2014), American Craft (2012), and Metalsmith (2014). Laura was the founding voice of the annual ECU Symposium and is a co-founder of Jewelry Edition, a creative project facilitating the growth of jewelry artists. Laura was a recent 2015 speaker at the annual Yuma Arts Symposium and a the spring metals concentration instructor at the Penland School of Crafts. She earned a BFA from the University of Georgia and an MFA in metal design from East Carolina University. As a student at the University of Minnesota, George Sawyer studied Art History and Sculpture and was fascinated with Asian Art. After finishing his studies, he developed his design and metalworking skills while working at a small company that designed and built some of the most famous racing cars of that era. During the day, he learned about fabricating beautiful machines from the world’s best automotive artisans, while during the evening he studied jewelry design. Combining these skills, he began to develop his signature style of patterned metal jewelry. George was the first to explore special techniques for creating patterned jewelry metals from colored gold alloys and precious metals. For over four decades, he has folded and forged precious metals into beautiful patterns that suggest images of wood-grain, swirling water or ancient and mysterious impressionistic forms. With his palette of multicolored patterned metals, George creates truly original jewelry ranging from simple wedding rings to complex art objects. He finds great pleasure designing new metal combinations that are an art in their own right, and jewelry that speaks to the heart and inspires the imagination. George’s jewelry has been featured in museums, galleries and fine jewelry stores in the United States, Canada and Europe. A member of the Society of North American Goldsmiths, the Contemporary Design Group, and twice president of the American Jewelry Design Council, he has received numerous jewelry design awards. George Sawyer Design studio is located in Minneapolis, Minnesota.